Hall tree drip pan or umbrella pan. 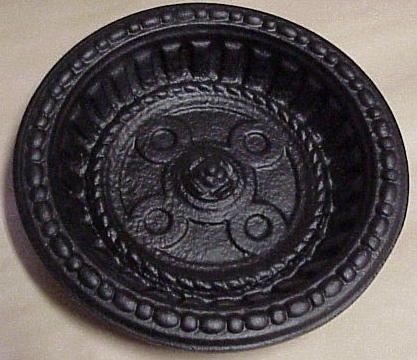 This is cast aluminum and modeled after a period victorian pan (c1860-80). 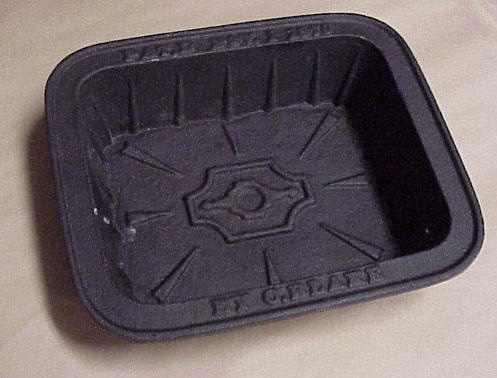 Very fine casting details, each pan is approximately 1 lb. Done in satin black paint unless otherwise noted. Many available, also making shell and round pans. Rectangular pan measures 6 5/8 x 8 1/16" at the lip. This is the largest measurement, your deck hole can't be bigger than this for our drip pans to work. The pan has a sloped body so largest measurement UNDER the lip is approx 5 3/4 x 7". If your opening is a fair amount smaller you either have to recut deck or have drip pans balance above instead of sitting flush. We also carry the round pans and smaller shell pans. Priced individually but we keep 20-30 on hand. If filling a large order please give 1 week lead time. Hall tree drip pan or umbrella pan. This is cast aluminum and modeled after a period victorian pan (c1860-80). Very fine casting details, done in satin black paint unless otherwise noted. Many available, also making rectangle and round pans. Shell pan is approx 7 3/4 at widest spot and 4 1/2" wide at base of scallop. Center measurement is 5 3/4"
Priced individually but we keep 20-30 on hand. If filling a large order please give 1 week lead time. The shell forms we have actually sold for other uses to decorators. One great idea was for a beach home, shells were painted antique vanilla white and used in corners of crown molding! Hall tree drip pan or umbrella pan. 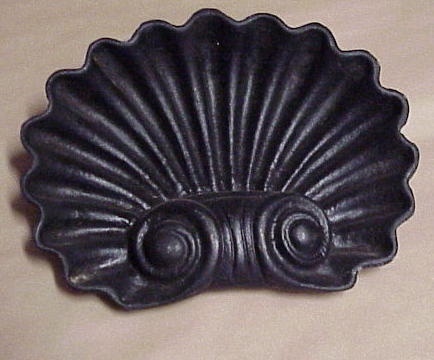 This is cast aluminum and modeled after a period victorian pan (c1860-80). Very fine casting details, done in flat black paint unless otherwise noted. Many available, also making square and shell pans. Tapered back, 8" topside with lip, goes into approx 7" hole for fitting into deck of hall tree. Approx 1 lb.